Banking Shri V.P. Nandakumar is the MD & CEO of Manappuram Finance Ltd.
H&M Entering the Indian Market In hopes that the growing population along with the rising incomes in Asia’s third largest economy will fuel the demand for H&M’s fast changing fashions, Hennes and Mauritz are planning to spend around 100 million euros ($130 million) on starting 50 stores in India. “It’s a very interesting market with a huge population and a growing middle class,” Fredrik Olsson, head of expansion of H&M told Reuters. Technopak, an Indian retail consultancy predicts that the textile and clothing market in India would be double to $141 billion by 2021 from the $58 billion in 2012. According Olsson, the company has found and mapped out many potential store locations where H&M plans on selling nine different product categories. RCom and Aircel to Team up The telecom operator Reliance Communications ties up with Aircel in order to improve the 2G GSM network coverage which involves both the companies using each others’ mobile towers. Reliance Communications is holding discussions with other operators as well in order to have similar arrangements and add a total of around 10,000 mobile towers in its network. The company said that it is expecting that all the agreements with existing telecom operators are likely to be completed by the end of the second quarter of the current financial year. Reliance Communications stated that the 2G GSM Intra circle roaming arrangements with various other operators will “significantly improve both the outdoor and in-building coverage,” of the company’s mobile network. As the Samsung Galaxy S4 launched up, and reviewers came about, they were all questioning Samsung’s preinstalled personal assistant S Voice as to what this smartphone is exactly? This was the same question which had led Apple’s Siri to say that the Nokia Lumia 900 was the best phone around left the Samsung Galaxy S4 puzzled. In a response to the question the S Voice app on the S4 gave a round of texts listening a random list of phones which included Alcatel 665, Apple iPhone 3GS, iPhone 3G and iPhone 4S, however nowhere was seen the name of Samsung Galaxy S4 or even the Apple iPhone 5. The Finance Ministry has decided to relax the tax residency certificate norm which is necessary but not sufficient after becoming tired of hurting foreign investments coming from the Mauritius route. A Finance ministry official said that “the original sub section 5 of the Finance Bill has been omitted completely.” Another official said that “it was to prevent any confusion for investments sheltered under Circular 789. But taxmen can call for information as per the respective DTAAs (double taxation avoidance agreement).” The Finance Ministry made it clear that the investments routed via Mauritius would continue enjoying tax protection under Circular 789 and the TRC would be sufficient. Etihad Airways & Jet Airways Deal Etihad Airways has decided to take nearly a quarter stake of Jet Airways, which gives it a big hold in the fast growing Indian market. By making this $397 million investment Etihad Airways has provided India’s largest carrier has gained a global partner as well as the cash to partially pay off its debt. This move would seem to be encourage more of the foreign airlines to enter into the Indian market. The regional head of the Centre for Asia Pacific Aviation (CAPA) Kapil Kaul commented that this move is “a game changing opportunity for Etihad, and a game changing opportunity for India.” Jet will be establishing a hub in Abu Dhabi as part of the agreement, expanding its reach through Etihad’s global network. The airline will also expand existing operations and introduce new routes between India and the Gulf. Biocon ‘s Net Increase The Biotechnology major Biocon reported an over twofold jump in its consolidated net profit to Rs. 248.61 crore for the quarter mainly on account of exceptional income. The consolidated net sales of the company, increased to Rs. 630.12 crore for the quarter from the Rs. 589.22 crore for the same period a year ago. According to Biocon, the company has determined that it does not have continuing obligations for clinical trials and development activities in respect of biosimilar insulin analogs. “The key contributors to growth this fiscal have been research services, branded formulations and our growing biosimilar business, led by the generic insulins,” said Biocon chairman and managing director Kiran Mazumdar. Biocon’s insulin franchise is continuing to gather the market share across India and emerging markets and now accounts for more than 10 percent of the company’s sales. APFC’s Investment The Alaska Permanent Fund Corp, which oversees the American state’s oil wealth portfolio has increased its investment in the Indian stocks to over Rs. 1,000 crore with increased holdings in bluechips such as ICICI Bank, Infosys, HDFC as well as Reliance Industries Ltd. In the January – March quarter when the domestic benchmark indices declined by over 3 percent, the specialized fund managers hired by Juneau-based Alaska Permanent Fund Corporation (APFC) hiked their investments in 38 Indian stocks. However the fund lowered its holdings in stocks such as Axis Bank, Bharti Airtel, Gail India and Tata Motors. The goal of the APFC Board is to achieve an average annual real rate of return of five percent at risk level broadly consistent with large public and private funds. Though the current scenario for the aviation industry remains to be tough and competitive, a good partner and an untapped potential in the low cost sector has made the Tata group re-enter the aviation space. When questioned as to why the group changed its decision on re-entering the sector, Tata group brand custodian and spokesperson Mukund Rajan said, “If you look at the low-cost carrier space, it is huge and it has not been adequately tapped. So, the opportunity is there.” The Tata group which started up the civll aviation sector in India is making its come back with Malaysian low-cost carrier AirAsia and Telestra Tradeplace of Arun Bhatia in a 49:30:21 joint venture. The decision came about from the fact showing partner AirAsia, the largest low cost operator in the continent to have proven a track record. Since the first commercial flight was grounded three months ago following the incidents of overheating in the batteries proving auxiliary power, the Ethiopian Airlines became the world’s first carrier to resume the flying of Boeing Co’s 787 Dreamliner passenger jets. After two lithium-ion battery meltdowns having occurred on two jets with other airlines withing two weeks in the month of January grounding all Dreamliners on January 16, the flight from Addis Ahaba to Nairobi was the first. U.S. Regulators approved a new battery design last week which cleared the way for installation and a resumption of Dreamliner flights by airlines worldwide. Though Ethiopian Airlines said that its fleet did not suffer any of the technical glitches which was faced by the other Dreamliner jets, it had withdrawn planes from service to undergo the changes as required by th e FAA. IKEA’s Proposal The Cabinet Committee on Economic Affairs took up the much awaited Swedish retail IKEA’s Rs. 10,500 crore proposal to set up the single brand retail store in the country. Earlier in January, Foreign Investment Promotion Board (FIPB) had cleared the investment plan of the firm to open the retail stores in the country. In the application proposed by IKEA, the company has made a proposition to invest the amount for setting up 10 furnishing and home ware stores as well as allied infrastructure over 10 years in India. It is eventually planning on opening up 15 more stores. This would be IKEA’s largest investment in the single brand retailing since the government has allowed for foreign investment in this sector. The investment arm of the Future Group, Future ventures, has made a 33 percent stake purchase in the Mumbai based footwear brand Tresmode. The acquisition of Tresmode will possible help Future Group to increase the focus on its core retail business after it divested its insurance businesses. The group had sold Pantaloon retail’s 50 percent stake in Future Generali to L&T Finance. Also the NBFC, Future Capital, was also sold to PE major Warburg Pincus which helped to cut the debt from Rs. 7,500 crore to Rs. 2,3000 core. The group has in the past also provided the capital to other fashion companies such as Biba and Anita Dongre. The recession wrecked country of Spain is in no way of seeing a hope of light as for the first time ever, more than 6 million people have become unemployed increasing the country’s unemployment rate to a record of 27.2 percent in the first quarter of 2013 according to the National Statistics Institute. In the first three months of the year, there was a 1.1 percent increase from the previous quarter where the unemployed number of people increased to 237,400. The total number of people who are unemployed happen to be exactly 6.2 million people. The Labor Ministry employment secretary Engracia Hidalgo described the figures to be “dramatic” saying that the government was working non-stop in order to make Spain a job creator again. Country’s Largest Copper Smelter to Remain Shut The country’s largest copper smelter will be remaining shut for now as a local environmental court transferred the case over its closure to New Delhi, thus extending a mouth long closure at the facility which meets half of the country’s copper demand. With Sterlite Industries smelter closed up, 3,000 tonnes per day of copper concentrates onto the market sending fees to process them to a five month high in Asia. The output at the Tuticorin facility, which half of the 30,000 tonnes of which it produces, was curbed after the local residents complained of emissions which resulted in breathing problems. Justice M Chockalingam of the National Green Tribunal commented that the “circumstances did not permit” the hearing of the case in the southern bench of the fast track court as it had been scheduled. Hero MotoCorp Hikes Up Prices Hero MotoCorp, the two wheeler market leader has announced a hike in price ranges from Rs. 500 to Rs. 1,500 across all of the models which is to take immediate effect. The hike is a result of the company report stating that there has been a 4.86 percent decline in the net profit at Rs.574.23 crore for the fourth quarter which ended on March 31, 2013. Durng the corresponding period last year Hero MotoCorp had registered a net profit of Rs. 603,59 crore. The estimated sales of the company fell by 2.56 percent during the last fiscal year which is to 60,75,583 units from the 62,35,205 units in 2011-12. Taking the current atmosphere into consideration the atuo sector is seemingly facing a tough time in Idnia, and according to Pawan Munjal, the managing director and CEO of Hero MotoCorp Hero MotoCorp is being cautiously optimistic about the growth prospects in the future. Maruti Suzuki Takes on Amaze India’s largest car maker Maruti Suzuki India has responded to the intensifying competition from Honda’s Amaze by conducting a “mileage drive rally” for its entry level sedan DZire across 31 cities. “We are celebrating the 5th year of the DZire and so we thought of conducting such a mileage rally to connect with our customers,” said the Maruti Suzuki India’s Vice President of marketing Manohar Bhat. “Competition is in all segments of the cars we sell. We welcome all competition. Our cars speak for themselves by their performance.” Bhat said that in the last five years since the launch, the DZire has been the largest selling sedan in India and the company intends to maintain the leadership position. Neeti Sharma, a marketing professional with over 11 years of experience has joined Unique Times as Vice-President Marketing. She is a dynamic person with rich experience in Brand Management, Business Development and Team Management. She also has experience in Training & Development and Module Development. She has earlier served in companies like Jet Airways and AVA Merchandizing. In contrast, NBFCs are less tightly supervised than banks, so they have greater operational flexibility. Banks are obliged to maintain up to 40% of their net bank credit as loans to the priority sector and also open at least 25% of their branches in rural and semiurban centres. be a study in contrast. The first of these is Kotak Mahindra Finance Ltd. (KMFL) and its conversion to a bank as Kotak Mahindra Bank Ltd. in 2003. As an NBFC, KMFL was hugely successful and considered one of the top NBFCs of those days. Today, as a bank it is well reputed but not in the league of the top performing banks in India. From the point of view of its shareholders too, it has been a let-down. As an NBFC, KMFL had delivered spectacular rewards to its shareholders. As a bank, the record has not been the same. On the other hand, when HDFC ventured into banking, they promoted HDFC Bank Ltd. as a separate entity. The outcome was different. While HDFC Bank has been very successful (it’s considered to the best private sector bank in India), there has been no let-up in the performance of the parent. HDFC continues to do well and reward its stakeholders. Conclusion In the context of examples of NBFCs venturing into banking, there is a Kotak model and there is an HDFC model and compared to Kotak, the path followed by HDFC is the smarter choice. As for Manappuram Finance Ltd., we have succeeded as a specialised gold loans company and it may not be a good idea to put it to risk by hasty conversion into a bank. Until the RBI opens up to the concept of specialised or narrow focus banks, Manappuram may be better off as an extraordinary gold loan NBFC rather than as an ordinary bank. C K Prahlad C K Prahlad was born in Coimbatore, India, His career started with Union Carbide. He then joined the coveted Indian Institute of Management, Ahmadabad for his post graduate studies. After that he moved to Harvard for further education, there he wrote a thesis on multinational management in just two and a half years. After obtaining Phd, he returned to teach in IIM But he soon returned to the United States, when in 1977, he was hired by the University of Michigan's School of Business Administration, where he advanced to the top tenured appointment as a full professor. In 2005, Prahalad earned the university's highest distinction, Distinguished University Professor. Prahlad advised Philips' Jan Timmer on the restructuring of this electronic corporation, then on the brink of collapse. C. K. Prahalad is the co-author of a number of well known works in corporate strategy, including The Core Competence of the Corporation (with Gary Hamel, Harvard Business Review, Mayâ&#x20AC;&#x201C;June 1990). He authored or co-authored several international bestsellers like Competing for the Future (with Gary Hamel, 1994), The Future of Competition (with Venkat Ramaswamy, 2004), and The Fortune at the Bottom of the Pyramid: Eradicating Poverty through Profits (Wharton School Publishing, 2004). His last book, coauthored by M. S. Krishnan and published in April 2008, is called The New Age of Innovation. otler was born in Chicago. He received his master's degree at the University of Chicago and his PhD at Massachusetts Institute of Technology in Economics. Professor Kotler is well known for his book Marketing Management which is the world's most widely used graduate level textbook on marketing. His other textbooks include Principles of Marketing and Marketing: An Introduction. Kotler has also written fifty other books on such subjects as museums, performing arts, place marketing, poverty alleviation, innovation, professional services, religious institutions, healthcare, education, tourism, hospitality, and corporate social responsibility. He developed new concepts in marketing including social marketing, atmospherics, demarcating, megamarketing, turbo marketing and synchromarketing. He believes that marketing is a major economic discipline that goes beyond promotion and selling to include product development, distribution and pricing theory and practice, often called the 4Ps. He is considered to be the father of Marketing Management. He was also awarded the First "Leader in Marketing Thought" by the academic members of the American Marketing Association. ack Welch was born in Peabody, Massachusetts Welch attended Salem High School and then the University of Massachusetts Amherst, graduating in 1957 with a Bachelor of Science degree in chemical engineering. He received a MS and PhD at the University of Illinois at Urbana-Champaign in 1960. Welch joined General Electric in 1960. He worked as a junior chemical engineer in Pittsfield, and was unhappy with the bureaucracy he observed at GE. Welch was named a vice president of GE in 1972. He became senior vice president in 1977 and vice chairman in 1979. Welch became GE's youngest chairman and CEO in 1981. Welch's public philosophy was that a company should be either No. 1 or No. 2 in a particular industry, or else leave it completely. Welch's strategy was later adopted by other CEOs across corporate America. Welch adopted Motorola's Six Sigma quality program in late 1995. In 1980, the year before Welch became CEO, GE recorded revenues of roughly $26.8 billion. In 2009, Welch founded the Jack Welch Management Institute, a program at Chancellor University that offered an online executive MBA degree. The institute was acquired by Strayer University in 2011. Welch has been actively involved with the curriculum, faculty and students at the online business school since its launch. eter Michael Senge is an American scientist and director of the Center for Organizational Learning at the MIT Sloan School of Management. He is known as the author of the book The Fifth Discipline: The art and practice of the learning organization from 1990. He is a senior lecturer at the System Dynamics Group at MIT Sloan School of Management, and co-faculty at the New England Complex Systems Institute. Peter Senge was born in Stanford, California. He received a B.S. in Aerospace engineering from Stanford University. While at Stanford, Senge also studied philosophy. He later earned an M.S. in social systems modeling from MIT in 1972. He also earned a Ph.D. from the MIT Sloan School of Management in 1978. He was the Director of the Center for Organizational Learning at the MIT Sloan School of Management. He is the founding chair of the Society for Organizational Learning (SoL). This organization helps with the communication of ideas between large corporations. It replaced the previous organization known as, the Centre for Organizational Learning at MIT. Peter Senge has written several books and articles throughout his career. r. Gary P. Hamel is an American management expert. He is a founder of Strategos, an international management consulting firm based in Chicago. He is a graduate of Andrews University and the Ross School of Business at the University of Michigan. Gary Hamel is the originator (with C. K. Prahalad) of the concept of core competencies. He is also the director of the Woodside Institute, a nonprofit research foundation based in Woodside, California. He is a visiting Professor of Strategic Management at London Business School. He was formerly a Visiting Professor of International Business at the University of Michigan (PhD 1990) and at Harvard Business School. His academic standing took a dent soon after publication of the hardback version of Leading the Revolution, in which he had written a very positive profile of Enron. Following the critical reception of Leading the Revolution, Hamel began work on resilience in business strategy. He wrote about the concept in a 2003 Harvard Business Review article titled The Quest for Resilience The Wall Street Journal in 2008 has ranked Gary Hamel as one of the world's most influential business thinkers, and Fortune magazine has called him "the world's leading expert on business strategy. tephen Richards Covey was an American educator, author, businessman, and keynote speaker. He was a professor at the Jon M. Huntsman School of Business at Utah State University at the time of his death. Covey earned a Bachelor of Science degree in business administration from the University of Utah, an MBA from Harvard University, and a Doctor of Religious Education (DRE) from Brigham Young University. He was a member of Pi Kappa Alpha International Fraternity. He was awarded ten honorary doctorates. The Seven Habits of Highly Effective People, Covey's best-known book, has sold more than 25 million copies worldwide since its first publication in 1989. Covey's 2004 book The 8th Habit: From Effectiveness to Greatness was published by Free Press, an imprint of Simon and Schuster. It is the sequel to The Seven Habits. Covey posits that effectiveness does not suffice in what he calls "The Knowledge Worker Age". Covey released The Leader in Me â&#x20AC;&#x201D; How Schools and Parents Around the World Are Inspiring Greatness, One Child at a Time in November 2008. It tells how some schools, parents and business leaders are preparing the next generation to meet the great challenges and opportunities of the 21st Century. dward Charles Francis Publius de Bono was born in Malta. De Bono then gained a medical degree from the University of Malta. He was a Rhodes Scholar at Christ Church, Oxford, in England where he gained an M.A. Degree in psychology and physiology. He also has a Ph.D. degree and a D.Phil. Degree in Medicine from Trinity College, Cambridge, a D. Des. Degree (Doctor of Design) from the Royal Melbourne Institute of Technology, and an LL.D. Degree from the University of Dundee. He originated the term lateral thinking, wrote the book Six Thinking Hats and is a proponent of the deliberate teaching of thinking as a subject in schools. He has written 57 books with translations into 34 languages. He has taught his thinking methods to government agencies, corporate clients, organizations and individuals, privately or publicly in group sessions. He has started to set up the World Center for New Thinking, based in Malta, which he describes as a "kind of intellectual Red Cross". In 1995, he created the futuristic documentary film, 2040: Possibilities by Edward de Bono, a lecture designed to prepare an audience of viewers released from a cryogenic freeze for contemporary (2040) society. A Dr Thomas Nechupadom heads Metanoeo, a total transformation/ grooming company that has been the by word for grooming and dressing, personality enhancement and Social/Corporate Etiquette for many pageants including Ms.South India and Mannapuram Ms. Queen of India contest 2012.
be done in a holistic way; there is always a scope for improvement. Every day writes down your improvements and where did you falter so that you necessarily do not repeat the same mistake. Another important thing is to write down your short term goals, the midterm goals and your long term goals and following them meticulously so that you achieve them. Be realistic when writing your goals and do not keep them out of reach. Once you achieve your short term goals you will feel more confident about achieving your long term goals. But also be a little creative about your goals, so that you will able to push yourself to attain the goals. Please always remember that there is not option for hard work. Also write a list of fifty things that you need to improve in your life. Writing it down will increase the number of times you notice those things and make improvements. Keep your mindset always positive and never be a pessimist. Integrate personal development into your daily lifestyle. Start applying personal development everyday in your daily life. With the new mindset you have now, you should continue to feed your mind every day with personal development. Personal development is a must for an entrepreneur to succeed so integrate personal development into your daily lifestyle. Initially you will have to take an extra effort to achieve difficult goals, but soon you will find that the difficulty is becoming easier. onfident Group, is a rapidly growing conglomerate, headquartered in Bangalore with operations in Kochi, Trivandrum, Trichur, Calicut, Dubai and Singapore. Confident Group is diversified into six verticals, namely- Infrastructure, Hospitality, Aviation, Entertainment, Education and Health Care. The Group is currently deploying 115 projects in the infrastructure sphere, which includes Gated communities of Townships, Villas, Apartments, Commercial Towers, Malls, Software Towers & Parks, Hotels and Resorts. The Group is the Largest Owners & Operators of Hotels + Resorts in Bangalore and also in the process of implementing similar Projects across different locations in South India. The Group is also setting up three schools across Bangalore, which can be used superiorly by every Confident Home buyer. The First School is already under Operation with exclusive tie-up with the famed Gear Foundation for Higher Education. & Safety Assessment Series Certifications. The Group is a "Zero Debt Group" which means that the Group is implementing and controlling all operations without any external source of funding. The Indian Entertainment Industry is growing at a phenomenal pace, offering remarkable opportunities to structured organizations . At Confident, we believe these opportunities exist across demography and languages. The Film Industry is also an Excellent Branding Vehicle taking the Group's name to all sections of the Society. Presently, the group has three hotels operational in Bengaluru, Confident Cascade at Bannerghatta Road, Confident Propus at Langford Road and Confident Iris at Brigade Road. According to Gaffar Kandy, Director of Sales, Confident Group, "We look forward to be the largest hotel and resort chain under a single brand in Bengaluru by 2014. Presently, three hotels are operational in Bengaluru. We plan to set up 10 hotels in the next five years. Lands have been acquired at different locations in Bengaluru to develop hotels, resorts and golf course." have 75 rooms and will mainly target the leisure clientele. Aviation This is the first Learjet in India and a Learjet is what a Ferrari is in automobile. This is the most expensive plane in its category. This has a seating capacity of 8. Confident Group is also acquiring one more plane and a helicopter in this Dubai Air show. This makes the total fleet of Confident Group to 4, the largest in South India Charter Airline. School for past 2 Academic years, we are commencing the functioning of Confident- GEAR Creative Leadership School located at Sarjapur. At Confident-GEM Plus style of teaching enhances learning through objective observation and application of logic. Social and intellectual discipline comes through selfmotivation and hard work. Spontaneous progress of the child is the greatest triumph of this Scientific Pedagogy. Our program is designed to help children broaden their basis of information, through concepts, acquired foundation skills & positive learning attitude; we sharpen the students’ perspectives and abilities by channeling their talents through a wide spectrum of areas, which promote the growth of students' reasoning, creative thinking, and research skills. Reggio Approach and Multiple Intelligences Incorporated. Admission system in a Montessori Environment permits children to start school at age two-and-a-half, before which the parents should have finalized their child’s admission, when the child turns two years old. In the Montessori system academic or Calendar year is not relevant while pertaining to admission, only the child’s age plays a major criterion. VISION Prelude: A magnificent Personality â&#x20AC;&#x201C; he has successfully created a business and an enterprise, and has handed over execution to his professional team â&#x20AC;&#x201C; all in just 7 years from start. The company runs on ERP, it is the most transparent and principled company in physical action and on web, and tens of thousands of families have already deposited their trust in this red and white firm. Interview with Dr. Roy C. J. Chairman, Confident Group. 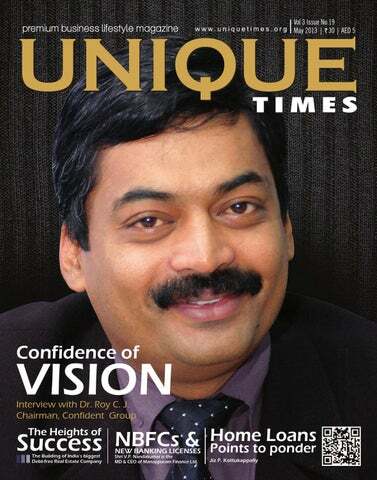 Dr Roy CJ has set many distinct records in terms of business principles, implementation of unique concepts, and of systematic and transparent operations of a builder, all in a very short span of 7 years. Read Below the excerpts of an interview with Ajith Ravi in a rare occasion where Dr Roy CJ returned back from Frankfurt after receiving the coveted Award 'International Arch of Europe'. Clarity of vision drives me; in the absence of this clarity, I feel that any entrepreneur, despite starting a venture will tend to go with the wind and eventually lose track in life. When in crisis of an employee, be it professional or personal, I am always right behind them. exposure in large size MNCs in new age industries and my entreprenuerial spirit converged at the right mix and the result is there, loud and large in front of all. How do you tackle challenges in your business? Any negative situation I consider as an opportunity. I look deeply for positive aspects in every challenge and have always been highly successful. One of the biggest and most important successes of Confident Group is the committed team. Today, we have close to 3,000 team members. At Confident Group, even during recession we have not retrenched a single employee but we have given bonus and salary increments every year and also salary on-time every time. This again is rare in the real estate industry. Keeping them alert and focused in real time environment is well done by the board of directors and this not only ensures delivery of quality to customers but also Job security and guarantee to the employees. How do you evaluate your strengths and weakness as a business man? My strength as a businessman lies in the marketing and branding talent in me. I also have a very strong vision and high focus on implementation. Once I decide something; come what may, I get the team to implement the same. When in crisis of an employee be it professional or personal, I am always right behind them. The weakness people say I have is the extremely fast decision making and I have always found this to be a major advantage. I can equally take various styles of instructing and guiding based on the personal style of my team members. How do you keep your body and mind fit? I play golf and regular workouts and walking in the park. Hobbies / special interests My biggest hobby is doing business the right way, producing cinemas, motivating team members and creating brand â&#x20AC;&#x2DC;Confident Groupâ&#x20AC;&#x2122;. Honda has gifted the Indian customers with the first diesel Engine; the good news comes in a sweeter package as the diesel engine is fitted into a compact sedan. The entry into sub 4 meter compact sedan segment opens a great opportunity to the Japanese car maker. Honda executives are quite happy with the reception that Amaze got in India. Amaze will certainly bring in the numbers that Honda is expecting. The Amaze feels well planted and precise around corners, and this feeling of confidence and poise remains even at higher speeds. to push it for overtaking you can feel a slight dullness, and it can be a problem, but the top end performance is really good. The Amaze petrol's super-light curb weight of 965kgs, will post a rather impressive 0-100kph time of 13.27Sec. The automatic gearbox-equipped petrol Amaze and it felt quite energetic. Initial responses to the throttle are good and the Amaze takes off from the rest with a considerable amount of acceleration. The Japanese major has also given the Amaze a good amount of ground clearance almost the same as the Brio. That means the notorious Indian roads will not take a toll on the under body even with a full load. The raised longtravel suspension also helps it ride well over Indian roads. Apart from the odd stuttering noises, the suspension tackles potholes and bumps rather well. The improved really compromise driving manners. The Amaze feels well planted and precise around corners, and this feeling of confidence and poise remains even at higher speeds. The power steering which is electrically assisted gives you a precise driving experience in low speeds and even in higher speeds. and there is a good amount of power and torque when it is needed. The big news is the mileage the diesel motor provides which is a record breaking 25.8kmpl as per ARAI test rules. Actual figures may be lower but one can expect the Amaze to be incredibly frugal in daily use. To achieve such low fuel consumption with a 1.5 litre engine and near 100bhp is in itself an achievement. When we look at the overall picture, however, and the new Amaze clearly has almost everything else buyers in this class are looking for, and now with prices announced its become even more desirable too. The Honda Amaze prices start at Rs 4.99lakh for the base petrol and goes upto Rs 7lakh for the top-of-the-line VX variant. While the Amaze diesel price starts at a low Rs 5.99 lakh and the top VX diesel will set you back by Rs 7.60 lakhs. These prices match the Maruti Dzire and it is only about Rs 10,000 more expensive variant. Maruti Suzuki unveiled its own allnew mini-SUV, the XA Alpha concept at the 2012 Auto Expo conducted in Delhi. The XA Alpha is based on the Swift platform and sticking to the SUV DNA this new mini-SUV is short in its stature it has got some funky headlights, and thick C-pillar. The interiors are likely to be similar Suzuki styling. It will sport the K-series petrol engine and 1.3-litre diesel power plant. It is expected to be released by sometime in 2013.